'Tis the season for holiday movies, festive lights and family gatherings. With that comes sugary foods, holiday soirées, stress and yes, weight gain. Holiday weight gain is real, and while it may not be as extreme as once thought–one study shows the average American gains one pound during the holiday season–the issue is that the average person doesn't lose that extra gain. That one pound each year can add up to 10 pounds in one decade. Gaining 10 pounds every decade can lead to health problems as you age. Do yourself a favor this season; don't fret about all the weight loss tips you've stockpiled over the years. Keep weight maintenance as your mindset. With both wellness and enjoyment in mind, there are a few healthy habits you can establish to help avoid the holiday gut this season. Whether it's last-minute gift wrapping or meeting deadlines at work, the holiday season brings a lot of stress and a general lack of sleep. And sleep is important for your overall wellness. A good night's sleep, especially during the busy holiday season, will help you wake up with focus and motivation to take on the day's challenges and make healthy decisions. When you're at a holiday gathering or surrounded with holiday leftovers, make sure to have plenty of water. We sometimes mistake thirst (or even being bored) for hunger. Instead of reaching for another hors d'oeuvre, drink a glass of water and wait a few minutes. If you're still hungry, then opt for a small portion. Avoid mindless snacking by enjoying holiday treats in the break room with coworker camaraderie and returning to your desk without any extra servings. - Park your car farther away to get more walking in. - Take the stairs instead of the escalator or elevator. - Get up and do a lap around the office every hour. - Do squats, planks or lunges during commercial breaks (and challenge anyone you're watching TV with for a friendly competition). Even if you only have 15 extra minutes, try a quick HIIT workout in the morning or run around a couple blocks in the evening. 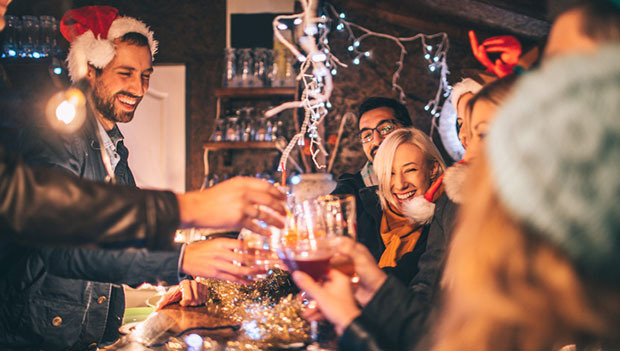 If you know you have a holiday party every Saturday for the entire month of December, make sure to keep that in mind the next time you go out to eat and want to indulge. If you know you're going to a relative's house and your family's famous casseroles and desserts will be there, plan for a proportional plate. This will take out the stress of the "should I or shouldn't I" debate and eliminate the guilt of enjoying delicious holiday food. You never know when you'll have a few minutes to go for a quick walk, so keep a pair of shoes handy in the trunk of your car. This way if you're at your child's soccer practice or have 30 minutes to spare during lunch, you can easily squeeze some exercise in. Keeping a journal of your workouts and meals will help you stay on top of your holiday indulgences. You'll know if you had a little too much to eat or hit your max of sweet treats for the week. If you walked a mile during lunch, note that. Seeing your accomplishments will motivate you to stay balanced. Keri Glassman, R.D. and founder of Nutritious Life, says people often consume 3,000 calories at a big holiday meal and then another 3,000 in leftovers the next day. If you're hosting a holiday gathering, put leftovers into the freezer instead of the fridge. That way they won't become mindless snacks for days to come. You can also split leftovers among your guests and send each home with a reasonable portion, keeping one portion for your household.